Because of our highly talented team, we are involved in providing a wide array of Work Platform Scissor Lift. e are renowned manufacturers, exporters and suppliers of Scissor Work Platform that is designed to offer vertical assistance work platform. These are made from the highest-grade raw materials and are precision engineered to offer impeccable performance and long functional life. 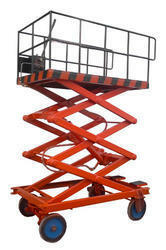 We are manufacturing world class range of scissor lift platform for our clients in different sizes and specifications. These table find their wide range of application in automatic feeding of tin sheets. 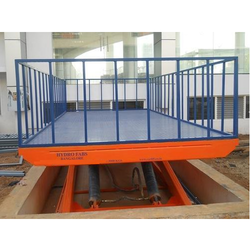 These are used in engineering industries, transport industries, water houses and in many other industries. These are used to move products from one place in a safe manner. Scissor Platform is based on advanced technology and quality raw materials. If our standard model does not suit your specification, we will design and engineer one that meets your requirement with our CAD system.